As most of you know, I’ve been a FitBit user for almost 2 years now. I started off using the Flex, then upgraded to the Charge, and my wife even had the Surge. I have experience with all 3 of these fitness trackers. I’ve written a few fitness articles and even called FitBit out earlier this year. I’ve still been a satisfied customer since their customer service reps have been quick to send me replacement bands without asking many questions. I liked the social aspect of their app, being able to see where I compare on the leaderboard with my friends. They also introduced challenges not too long ago, which added a fun twist to the leaderboard. Before I can compare the fitness trackers, I should share my typical day and how I would use the trackers. With my career, I’m all over the place. Sometimes I’m stuck at my desk for hours and sometimes I’m out walking around for most of the day. For other exercise, I have a gym membership but with my family’s busy life, I don’t make it there as often as I would like. When I do go, I tend to focus on stregnth training more than cardio. The family has been going outside for walks in the evening and on the days my son has soccer practice I’ll go walking around a path at the park. I was trying to jog/run more and train for a 5k, but then I got a minor foot injury which prevents me from running right now. With the fitness trackers, coming from FitBit, I was focused on how many steps I did throughout the day. I would try to reach the goal of 10,000 per day, even if 7,000 of them came from walking around at work. As my wife knows, there’s a big difference between casually walking at work and putting in effort to power walk for 10,000 steps. I’ve had the Apple Watch for over a week now and so far I’m loving it. If I had to pick one, I would pick the Apple Watch if it is in your budget. Obviously, if you use any phone other than an iPhone you’ll want to go with a FitBit. The FitBit app has the social leaderboard and the Apple Watch doesn’t have any social features (at least not yet). You can earn achievements with both apps, which is a way to have personal motivation. When it comes to actual exercise, I like the way the Apple Watch functions over the FitBit. The Apple Watch has 3 main daily goals, which are: carlories burned, exercise minutes, and standing minutes. All of these can be adjustable. While I had the FitBit, I was focused on getting my step goal every day. It would set other goals as well, but I think most people would go by steps. I don’t quite understand the way FitBit calculates the amount of calories you burn throughout the day, but it is completely different than the way the Apple Watch does. I’ll use yesterday as an example. I walked throughout the day at work, then went to the park and walked a 1/4mi path for an hour and a half. Normally, with my FitBit, I probably would have just stopped once I reached my 10,000 step goal for the day and thought that would have been enough. Using my Apple Watch, I was going by calories burned. Before I got to the park, it showed that I had burned 600 active calories for the day, meaning I had to burn an additional 400 calories. Going into the Exercise app on the Apple Watch, I set my workout goal to 400 calories. After walking a couple of laps, I calculated that I needed to do over 12 laps (3 miles) to burn my 400 calories. At the end, I did over 15,000 steps for the day and burned my 1,000 active calories. I still fell short of my exercise minutes though. Even though I did almost 2 hours of walking, it wasn’t at a very fast pace. After doing some research, the Apple Watch only counts exercise minutes if it detects your heartrate increased. My average for my walk was 144bpm, which I guess wasn’t high enough to count it all as active minutes. In my opinion, the way the Apple Watch reports your activity is much more accurate for those trying to get healthy or lose weight. It motivated me to do even more steps than I normally would have done. MyFitnessPal: I’ve also been using MyFitnessPal to log my food and other activities. Both fitness trackers can sync data with MyFitnessPal. The FitBit app will let you track food, but it will only show you calories, not a breakdown of carbs, fat, protein, etc. 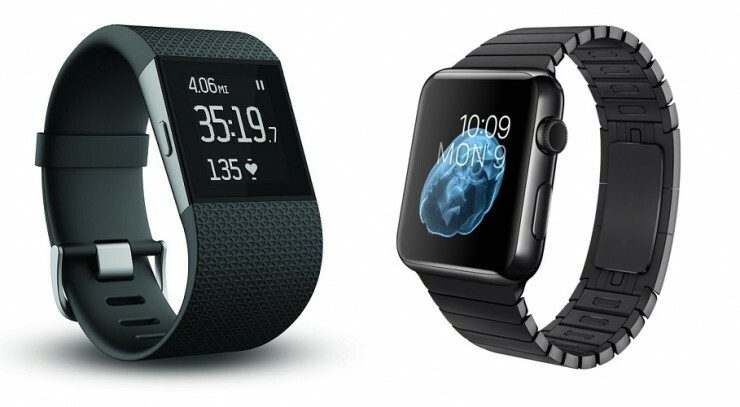 Battery Life: Battery life on all of the FitBit trackers is much better than the Apple Watch. In my experience, the Apple Watch won’t get more than one day from a single charge, at least not without disabling a bunch of features which defeats the point. Notifications: The Fitbit Charge will notify you of phone calls, but that’s it. The Fitbit Surge will notify you of phone calls and text messages. The Apple Watch can notify you of almost any notifications you would normally get on your iPhone. Other Features To Note: The Apple Watch will also let you take phone calls from your watch. You can also store music playlists onto the watch, sync your bluetooth headset to it, and listen to your music without even having your phone on you. If you’re an outdoor runner though, the Fitbit Surge has built-in GPS that can track your run and save a map. To do that on the Apple Watch you would need to carry your phone with you and use its GPS. Everybody’s needs and usage is different, so based on what functions you need, either of these fitness trackers can get the job done. If you’ve used one or both, I would like to hear about your experiences in the comments. Also feel free to share about your experiences with any other fitness trackers and smartwatches like the Microsoft Band, Polar Watches, Pebble Watches, Jawbone, etc.